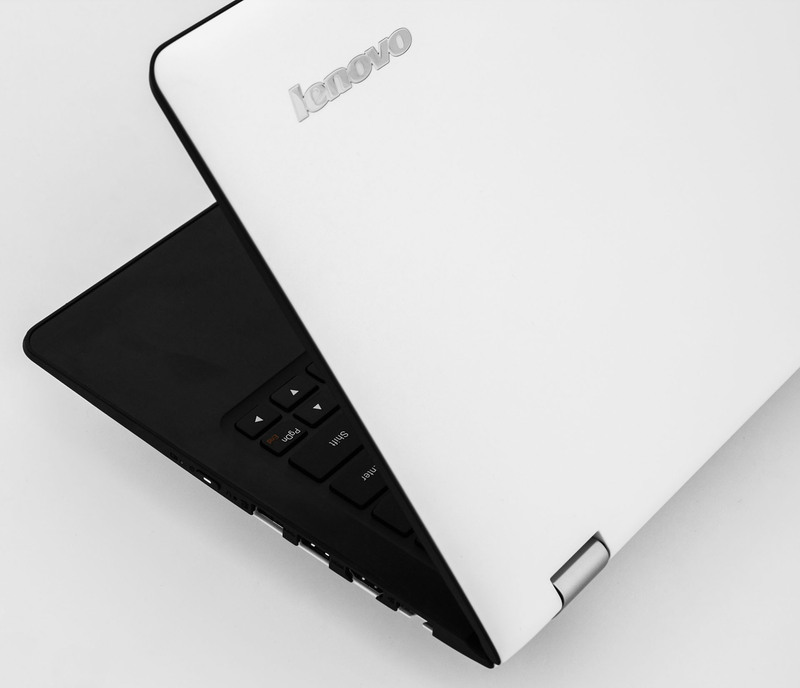 Until now the Lenovo Flex series consisted of touchscreen notebooks with 300-degree hinges that allowed you to use them in three modes – as a notebook, tent, or as a tablet with kickstand, also known as kiosk mode. The new Flex 3 series features full 360-degree hinge that can rotate the screen all the way back to get into tablet mode just like Lenovo’s hit Yoga series. This can be useful if you just want to lay back and browse through some websites by just turning the device around. 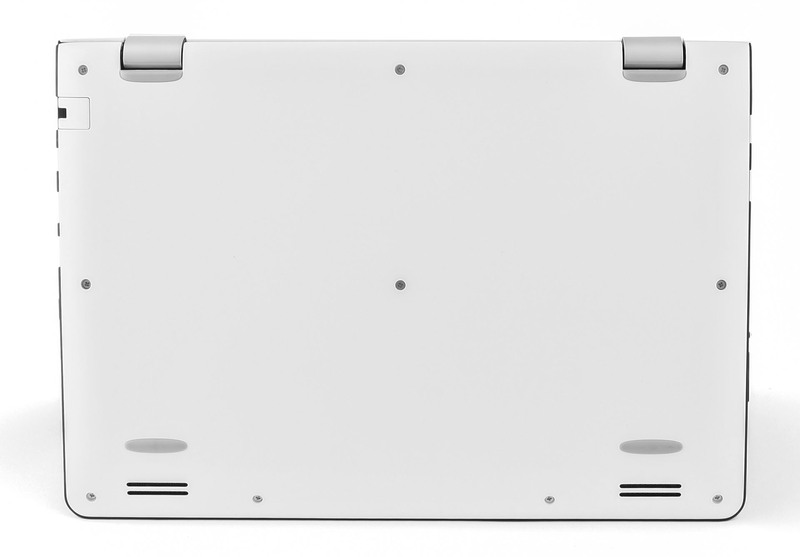 In addition to the new hinge there is a new very affordable 11-inch Flex 3 model along with the 14 and 15-inch ones. Although it is a really cheap and affordable device, it does have a pretty good build for its price, again proving the dedication of Lenovo to make quality devices. It might not have powerful internals and you won’t be able to do any serious work, but it is a good casual device when you flip it in tablet mode for surfing the web while relaxing on the couch, and if you get the sudden urge to write something you can easily turn it back to notebook. 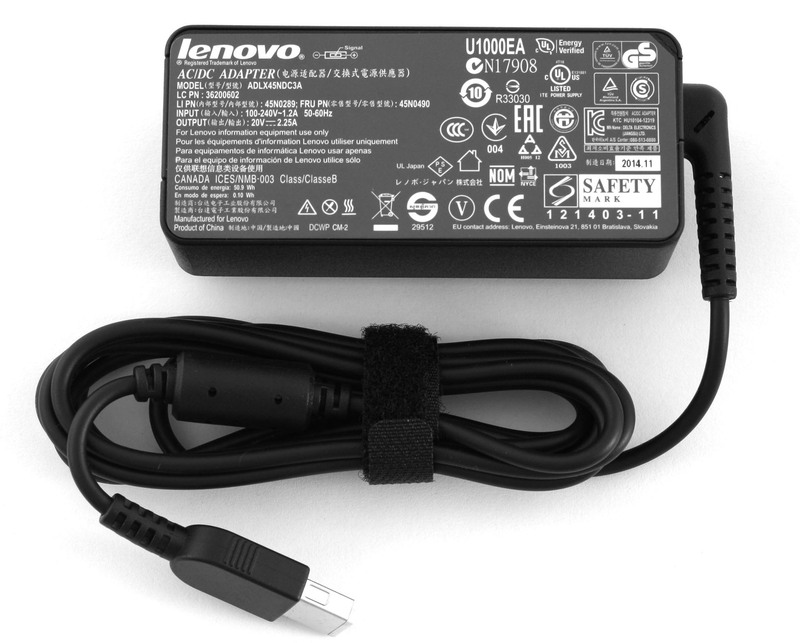 The unit we have with us is an engineering sample and the name of the device had not been finalized by the time we had the device, so you can see it is labeled as Lenovo Mini Flex 3 (1120-SIT-SKU2) on a sticker on the lid, the final retail name is Lenovo Flex 3 11-inch, 1120 and we will refer it like this in the review. We have an engineering sample that came only with an AC charger so we can’t be sure what the final retail box will include. 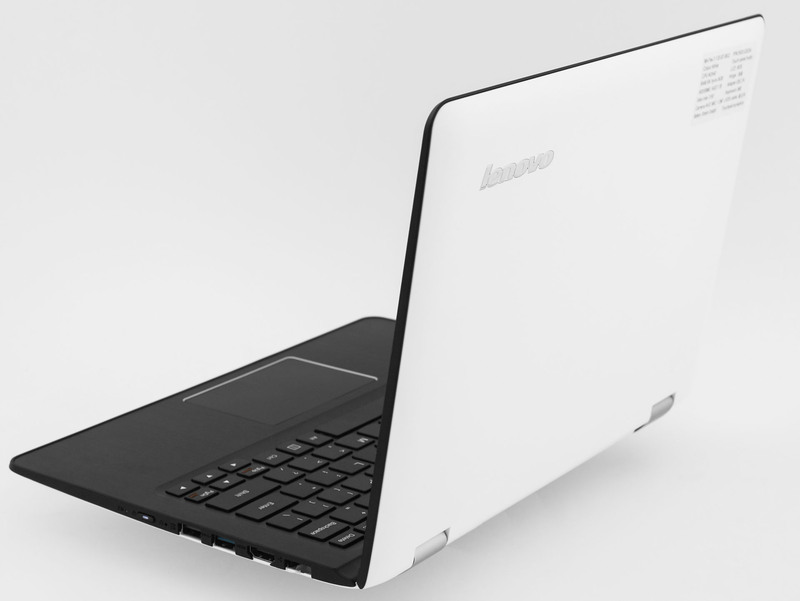 Lenovo have changed the design of the Flex 3 a bit from the previous generation, most notably the hinges are now similar if not identical to the ones on the original Lenovo Yoga and the notebook can be flipped 360° instead of just 300° on the previous models, so it can be used entirely like a tablet. The exterior of the Flex 3 11 is made of plastic with the exception of the metal hinges that squeak a little when rotating the device to tablet mode (we hope this is fixed in the retail units). The lid and bottom shell of the unit we have feature white matte plastic (there is also black version) and while it does look stylish it unfortunately attracts dust and dirt quite easily. On the other side of the lid is the 11.6-inch screen with a glossy finish that seems to be a fingerprint magnet, so if you use the touchscreen a lot you might have to clean it up fairly frequently. There is also a webcam over the screen and the Lenovo logo on the huge bezel below. The palmrest is made out of brushed aluminum that is painted black. 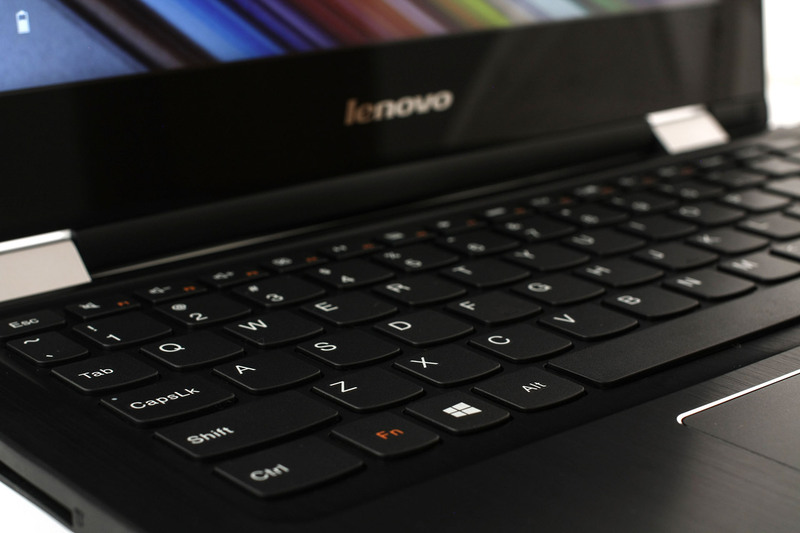 The keyboard is comfortable for the size, but it’s not as great as the ones on the high-end Lenovo notebooks. When flipped in tablet mode it is not very comfortable and due to the higher weight than a normal tablet it can tire your hands pretty quickly, so if you want to use it as a tablet you might want to leave it on a surface and not hold it in your hands. Going around the sides of the device on the left we have a volume rocker, rotation lock button, combo audio jack, 4-in-1 card reader slot, USB 2.0, DC power port and a Kensington lock. Moving to the right we have battery status LED, power button with system LED indicator inside, Lenovo OneKey Recovery pinhole, always-on USB 2.0 port, USB 3.0, HDMI, and collapsible Ethernet port. The front of the device does not feature anything and as the Flex 3 11 is fanless, unlike its bigger brothers Flex 3 14 and Flex 3 15 it does not have any exhaust holes on the back, only the metal hinges stand out. On the bottom we have two speaker grills in the front left and right. 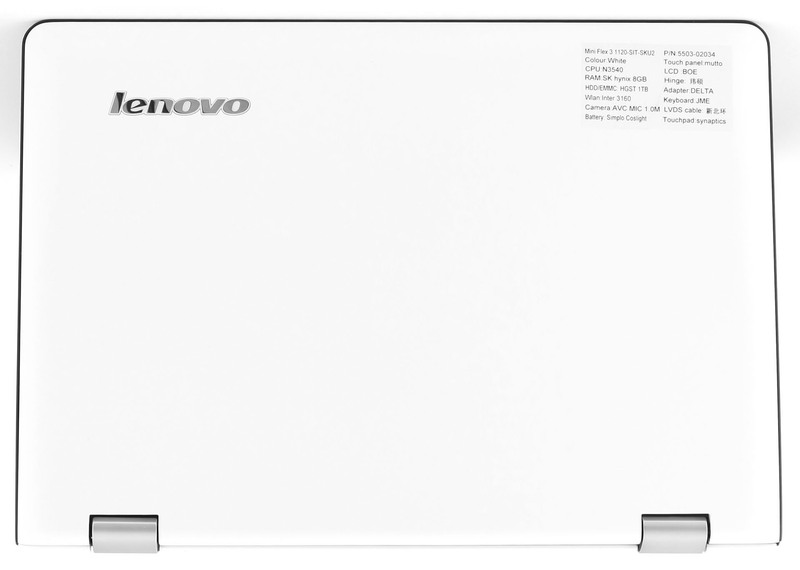 Lenovo Flex 3 1120 features HD multitouch TN panel, model BOE NT116WHM-N11. It has a diagonal of 11.6 inches (29.46 cm), the resolution is 1366 x 768 with an aspect ratio of 16:9. The pixel density is 135 PPI (pixels per inch), with space between each pixel 0.188 x 0.188 mm. The screen can be considered “Retina” when viewed from a distance equal or greater than 64 cm. 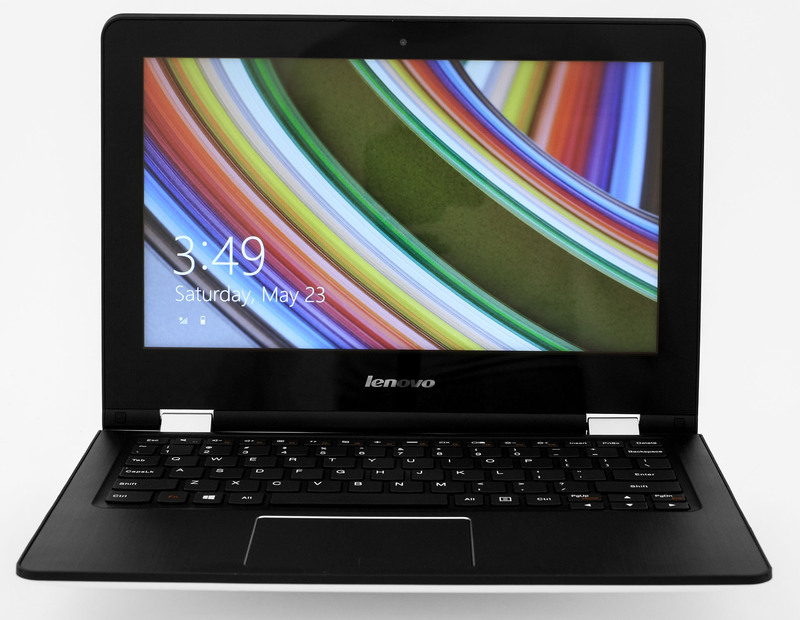 Lenovo Flex 3 11 has uncomfortable viewing angles. You can see how the screen looks under 45° angles below. The maximum brightness we measured before profiling is 204 cd/m2, excellently distributed over the screen surface with maximum deviation of only 4%. We consider this brightness optimal as it is enough for working in a bright room (but not outside). Also it is not too high, so you won’t have to constantly lower it in a normal working environment. This is good because the backlight does not pulse only when the brightness is set to max (see below). The average color temperature measured on white screen and maximum brightness is 7280K – slightly colder than the optimal 6500K (daylight). There is no unacceptable deviation of the temperature on the surface. The yellow triangle shows the capabilities (Color gamut coverage) of the Lenovo Flex 3 11. The panel covers 58% of sRGB and 43% of Adobe RGB, or in other words – a very mediocre result. The figure below is the same, but with measurements from the screen before calibration with the factory settings. The colored circles are the colors the notebook is supposed to reproduce (sRGB/rec.709 Standard Color Gamut Reference Colors) and the white dots are the actually displayed colors. The primary and secondary colors are shown with 100 and 50-percent saturation inside the color space. The white arrows show the measured colors that are too far from the reference values (they are displayed with significant error). We profiled the display with brightness set to 140 cd/m2 and color temperature of 6500K. For calibration we used X-Rite i1Display Pro. We tested the colors before and after recording the profile in Windows. Because of the poor sRGB coverage the colors with 100% saturation (red and purple) are replaced by the closest possible, the calibrator can’t do much here. The lack of these colors will lead to the feeling of a pale picture. After profiling the display has relatively good distribution of the white levels. The average gamma before calibration is 2.29 and after calibration it got to 2.18. We tested the display with 24 color samples, including commonly used colors and ones the eye easily recognizes – dark and light human skin, blue sky, green grass, orange, and others. Most are in the middle of the color space and after calibration their accuracy is pretty high – DeltaE 76 = 3.19. 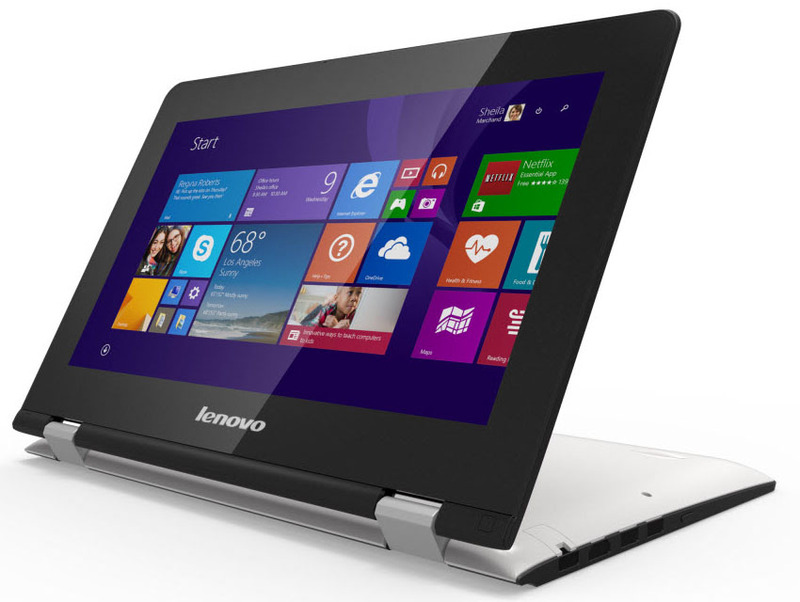 Lenovo Flex 3 1120 emits pulse-width modulating light from the backlight for all levels except the highest. Another drawback is that the frequency is low – 200 Hz. If the brightness slider is at 100% there is no PWM and the screen will be comfortable for your eyesight. The graphic below is useful mainly for gamers (although this is certainly no gaming rig). It illustrates the responce time of the pixels in modes from “Black” to “White” plus “White” to “Black” for levels from 10% to 90% and back. The matrix is three times faster than IPS. We measured Fall Time + Rise Time = 9.2 ms. The display of the Lenovo Flex 3 1120 is suitable for watching video and playing games, because it has a fast panel and accurate colors from Color Checker. Due to the scarce coverage of the sRGB color space it will not be suitable for work, involving image processing. 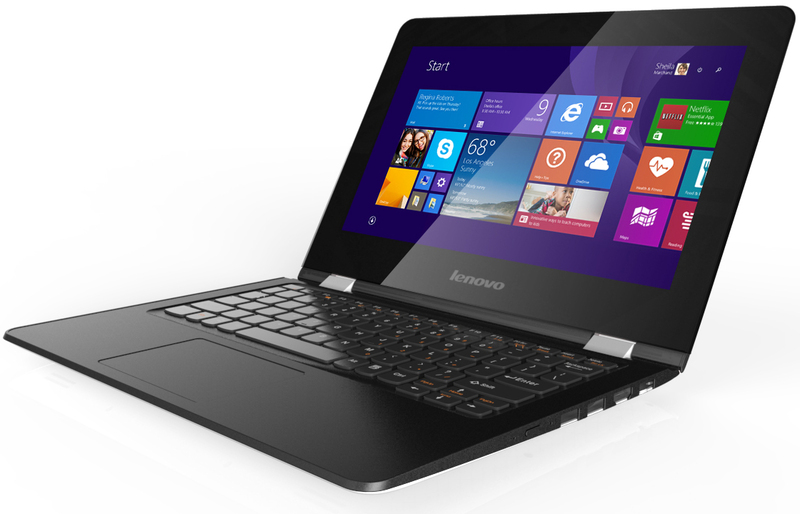 Lenovo Flex 3 11 has a very good sound quality in the low frequencies. The balanced sound and clarity are maintained in the upper range as well, which characterizes good possibilities for reproduction of complex sound compositions along with power and details in relatively wide range. The unit is equipped with a 2-cell 30Wh battery inside and we were pretty disappointed by the results we got from the little convertible, as they are far lower than most devices in this class. We have to note again that this is a pre-production engineering sample and the results we got may vary from the retail units. All tests were performed under the same conditions – Wi-Fi turned on, Bluetooth is off, power saver is on and screen brightness is set to 120 cd/m2. We got only 165 minutes (2 hours 45 minutes) on this unit which is a pretty low result. In this test we again got a disappointing result of only 172 minutes (2 hours 52 minutes). Intel Pentium N3540 is low-voltage, four core processor, announced near the end of Q4, 2013. It is an integrated (soldered onto the motherboard) package, which is part of Intel’s budget line of processors. The chip is based on the “Bay Trail” architecture and operates at a base frequency of 2.16GHz. A typical representative of the Pentium family, N3540 does not sport TurboBoost or HyperThreading functionality. Unlike other Pentiums, however, it is outfitted with a technology very similar to TurboBoost, which can increase the clock speed of all four cores to 2.66GHz. The chip is equipped with 224KB of first level cache and 2MB of third level cache. The Intel Pentium N3540 has been developed using a 22nm process, allowing for the integration of the Intel HD Graphics (Bay Trail) controller. It operates at a base frequency of 313MHz and has a maximum dynamic frequency of 896MHz. Power consumption of the whole system on a chip is 7.5 watts, and its maximum operating temperature is 100C. Fritz is a chess benchmark which tests the computing capabilities of the CPU with various chess moves. The Intel Pentium N3540 managed to get 4.238 million moves per second. For comparison, one of the most powerful PCs, Deep(er) Blue, was able to squeeze out 200 million moves per second. In 1997 Deep(er) Blue even beat the famous Garry Kasparov with 3.5 to 2.5. Intel HD Graphics (Bay Trail) is a graphics controller, integrated into some Atom chips (e.g. Atom Z3740) but is mostly targeted at tablets. It is based on the Ivy Bridge architecture but only has four execution blocks. When compared to mobile graphics solutions, HD Graphics (Bay Trail) performs much like the Adreno 320 or the Tegra 4. Compared to laptop graphics, Bay Trail would be placed just below the HD Graphics (Sandy Bridge). Performance of the Bay Trail graphics is sufficient for a 2560×1600 resolution, allowing for gameplay of some older titles or just less graphically-intense titles like FIFA 13. We also tried running Metro Last Light and we were able to get measly 5fps on the low setting, but at higher settings the game did not respond. Also just for the sake of it we tried playing Grand Theft Auto V on this small machine but unfortunately it was unable to even start. Every notebook that we review undergoes two basic stress tests. The first one is putting the CPU at 100% load. Under normal conditions the CPU temperature was around 50°C and after an hour and a half, temperatures were steady at 66-68 degrees, which is a great result for a fanless notebook. We did not notice any throttling during the test. After hour and a half along with the computational load, we added 100% GPU load and we left the PC running for another hour, going up to 2 and a half hours alltogether. We have to note that immediately after launching the GPU load, the CPUs frequency dropped to 500MHz. At the end of the test temperatures were surprisingly lower than the plain CPU stress test with average 64 degree CPU. This can be explained by the significant throttling that started right after the GPU stress test began. You can see how the inner temperatures affect the user experience on the heat map below. There was no excessive heat over the keyboard or palm rest and it was comfortable to work after a long period of stress testing. 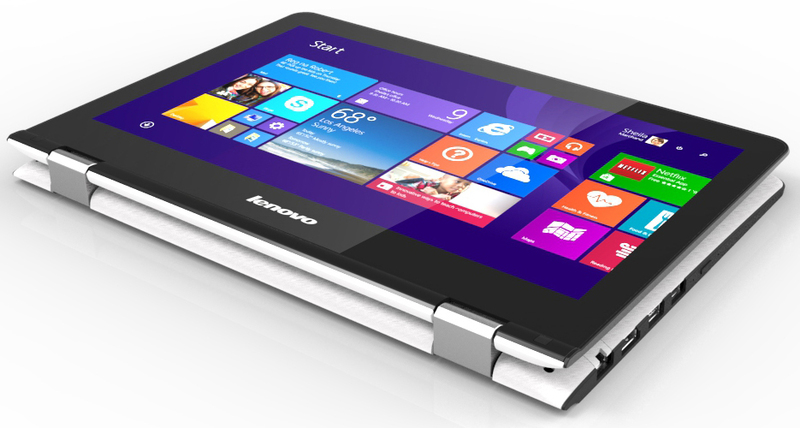 The Lenovo Flex 3 11-inch is a decent convertible for casual use. It offers basic performance that is mainly suitable for browsing the web, playing some not so demanding games or writing. The change in the flexibility from 300 on the previous generations to a full 360-degree Yoga-style rotation is a welcome improvement. 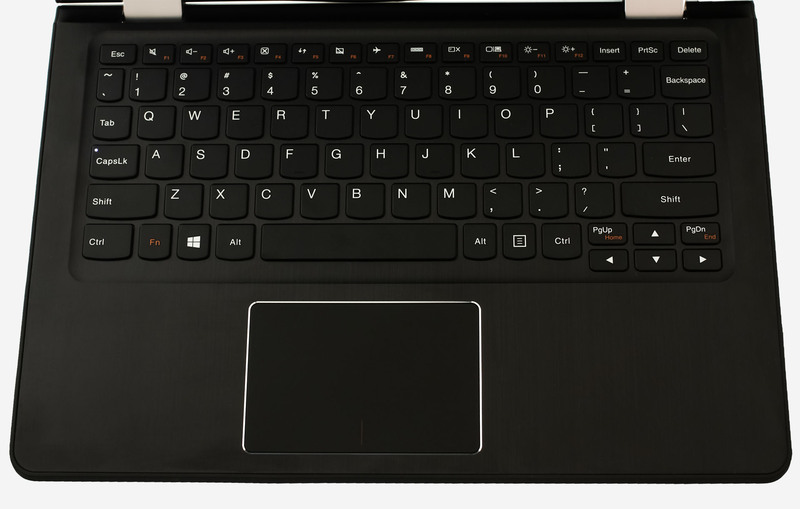 The overall design of the device is quite good and stylish, the notebook feels solid in hands and even though it has a really low price it does not have the usual plasticky feel of a cheap device. The fanless design of the notebook worried us at first but all doubts were dismissed as it stayed cool even under prolonged high load, even though it might tire your hands after long ussage in tablet mode. Unfortunately its display is subpar, offering low color gamut coverage and PWM across all but at maximum brightness level, so you might want to use it only in well-lit rooms at 100% brightness setting. Given that, the primary use for the device is for multimedia and work with non-demanding applications.